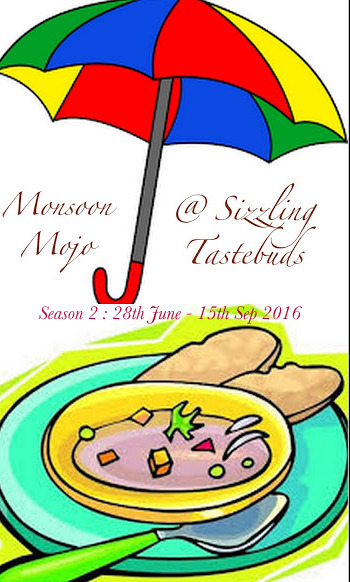 Hosting Monsoon Mojo (Season 2) + a giveaway ! After last year's success of Monsoon Mojo, am back with Edition 2 of this popular event along with a giveaway ! Monsoon here in mumbai means Hot n spicy Vada Pav, endless cups of Masala Chai (Spiced Milky Tea), Hot Parathas, Bhajias (deep fried fritters) and much more.. So, for the next 2 months+, lets celebrate this with food that's apt for the Indian Monsoon ! Here's how to send your entries..
1) Post your entries between 28th June - 15th Sep 2016 (Pacific time) with monsoon treats as a theme of any dish you would generally associate with monsoon, with a linkback to this event announcement. Important: The event is called #MonsoonMojo2 on the blogosphere - be sure to mention this hashtag in all your post (Title) to qualify for an entry.. for eg: if you are sending an entry for Onion pakoras, make sure the title of your post says "Onion Pakoras #MonsoonMojo2 ". 3) Max of two archived entries per blogger, updated with this link announcement is allowed. 5) Use the linky code below to link your entries. Please note a link back in your post to this event announcement is mandatory to link up. Look forward to all your yummy entries.. In the final post using Potato this week, today we have the evergreen Aloo Methi (potato and fenugreek leaves) stir fry. Its probably a combo that steals hearts across regions and age groups,and therefore made in a zillion ways. I love the way my mom makes it, and thats captured in this post today. Hope you enjoyed the series made with Potato this week : Dahi Batata Puri & Baked Honey Chilli Sesame Sticks. 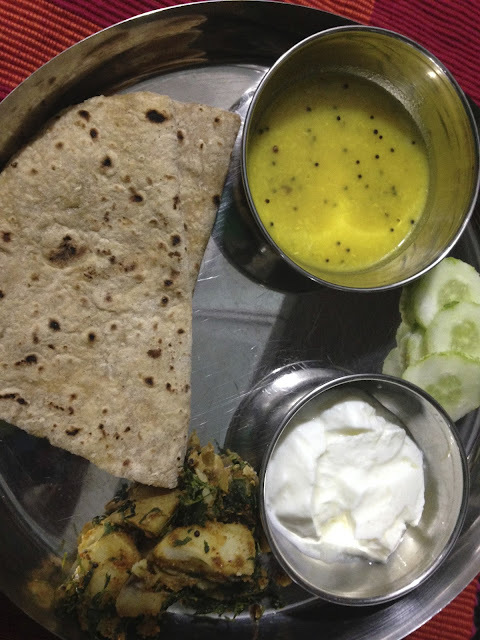 Served in this Mini thali : Wholewheat Chapati (Roti), Sukha Aloo Methi, Dal, Salad and yoghurt. Boil (or pressure cook) and peel potatoes, cube them into required shape or slightly crumble them, but not mashing them. Clean wash and chop the methi (fenugreek leaves) finely. In a pan, heat oil. 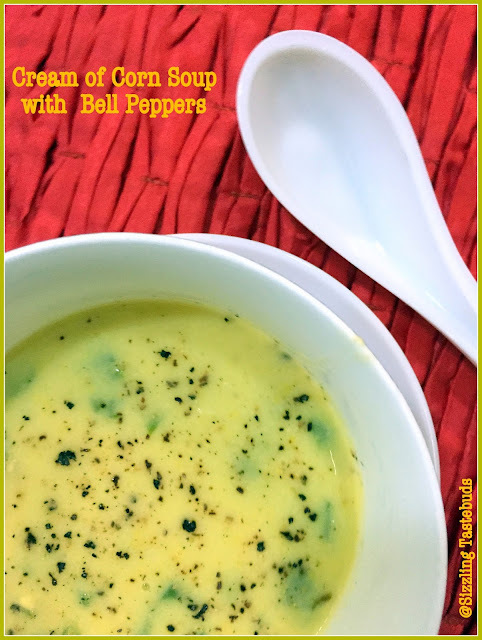 Splutter cumin and mustard seeds, add turmeric and chopped fenugreek leaves. saute for 3-4 mins. Add a pinch of salt , sprinkle little water (2 tsp) and cook for 5-6 mins till slightly wilted. Now add the slightly mashed / cubed boiled potatoes, all spice powders and jaggery. Saute for further 2-3 mins till dry and all water evaporates. Potato being the chosen ingredient for this week, I made this simple baked treat as I didn't want to deep fry potatoes (although I have bookmarked Gayathri's spicy potato sticky wedges recipe - that's for some other day). 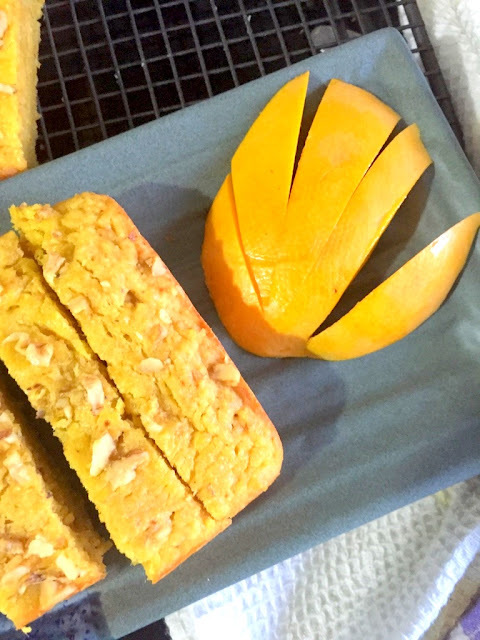 Takes minimal prep time, and makes for a healthy treat that kids love to indulge in. 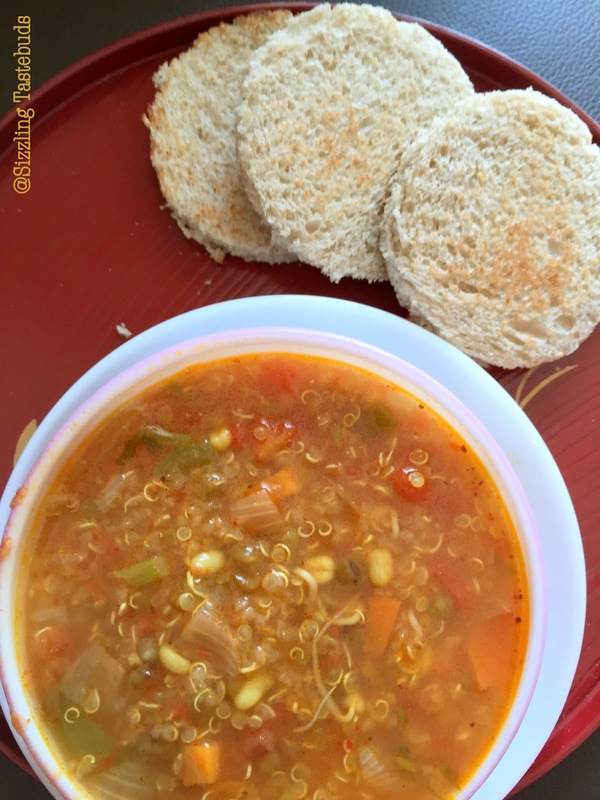 Great for monsoon days when you want to snack lightly. Scrub the potatoes well, wipe them dry and cut into thinnish strips with the skin on. In a bowl, mix all the other ingredients and marinate the potatoes for 5 mins. Lay the marinated potatoes on a prepared tray / silpat sheet in a single layer and bake for 12-15 mins till they are done. Time taken might differ from oven to oven. Summer. Curd. Chaat - Do you need any more excuse ?? Probably not. 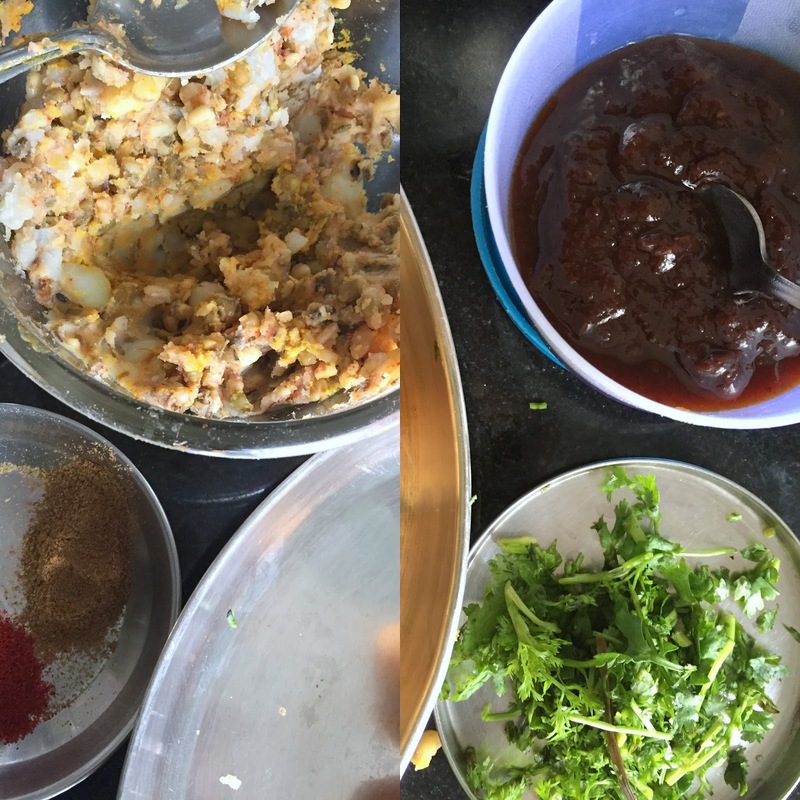 If you have the ingredients ready beforehand (which are mostly pantry staples), then assembling this lip smacking chaat is a matter of minutes. And they disappear in a jiffy too !! 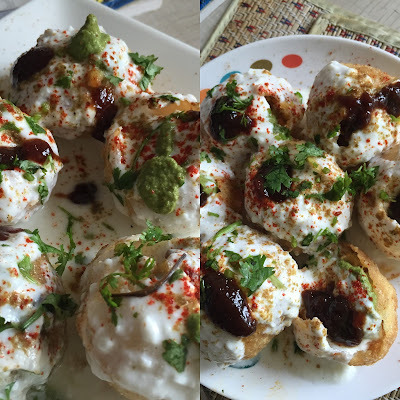 For chaat lovers CANNOT NOT love Dahi Batata Puri (Dahi = curd, Batata = potato, Puri = puffed crispy ball). We are doing a Potato series this week, and I couldn't help but blog about this family favourite. Diabetic ?? Not to worry, you can easily substitute Potato with Sweet potato or even add extra Boiled sprouts / Boiled chickpeas. Vegan ? Not to worry, you can sub the yoghurt with cashew / soy or any other vegan yoghurt of your choice. No potato ? You can still have the Dahi Puri stuffed with any boiled sprouts with a dash of yoghurt and the lip smacking chutneys. What's your excuse to make this now ? Head to the kitchen to make a plate now ! Garnish : Coriander leaves (chopped) and fine sev (gram flour vermicelli) - opt. 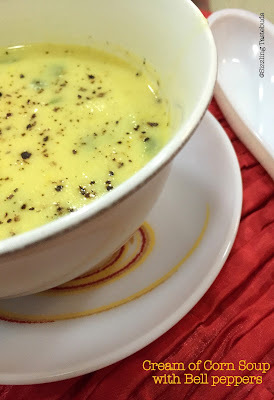 Whisk yoghurt free of lumps, add chaat masala, jeera powder, a pinch of sugar and mix well. Chill for 15 mins. Boil potatoes till fork tender. Peel and crumble them lightly. If using boiled sprouts or kala channa (dark coloured chickpeas), slightly crumble them and add to the potato. Add chaat masala, salt, kala namak (Black salt), jeera powder - mix well and keep aside. 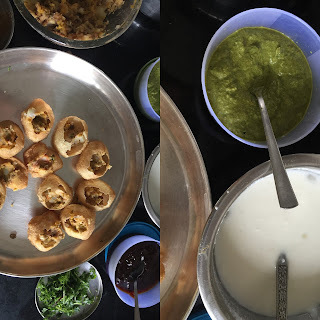 Take 5-6 pani puris / Golgappe in a plate, slightly crush them at the top to stuff the filling. 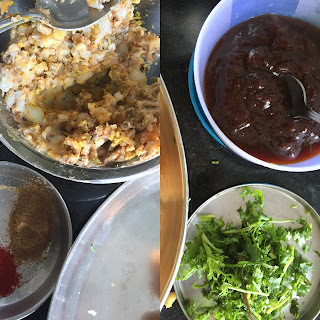 Add the potato - sprouts mixture, top with chilled yoghurt, add the chutneys (sweet and coriander-mint), sprinkle a little jeera powder and sev and garnish with green coriander. Come summers, and its pickling time at my house. Lemon Bittergourd Pickle, Instant Mango Pickle, Gooseberry (amla / nellikai) pickle, Mixed Veg Pickle and so on. I recall grand mom filling the ceramic jars with a year’s supply of pickles during summers. As kids we were prohibited to touch these pickles with naked hands. With the passing of weeks, these pickles were taken - a little at a time, and served with clean sterile spoons, till the next batch was to be used. There are at least 200-300 varieties of pickles made across india, perhaps more ! These condiments are in sweet, spicy, super hot, tangy and so many other lipsmacking flavours, each of them ranging from the Rajasthani Green Chilli pickle to the stuffed red chilly pickle to the Vadumaanga (baby mango) pickle of the South to the Carrot / radish pickles made during Nov / Dec winters (yes, that’s another pickling season in North India). Today’s pickle is made with fresh daikon radish and green chillies, is vegan, grain free & can be made GF too .. Turmeric, fenugreek seeds and asafoetida along with lemon juice paprika make a lipsmacking condiments that keep well for 6-8 weeks on the countertop. 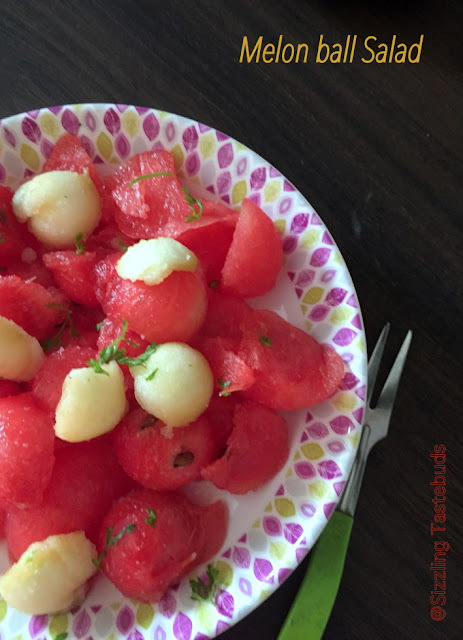 Like the Instant Cucumber Pickle or the Fenugreek sprouts pickle, this too can be made any time you have access to fresh veggies and is not season-specific, although the best juicy radish are found in the winters. Take care to select the best (non fibrous) radish for best results. 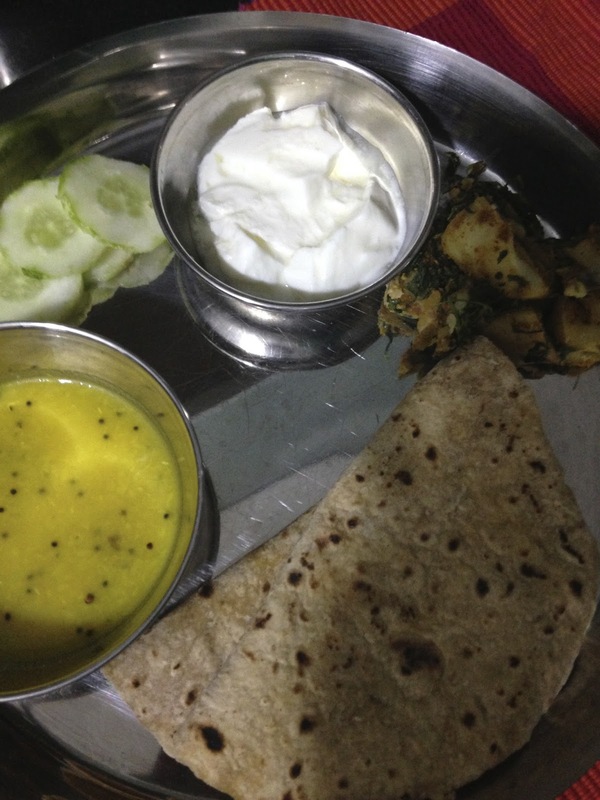 With a standing time of 2 days, this is sure to take your Indian Thali (meal) several notches higher. Dry roast fenugreek seeds, mustard seeds one by one and powder fine. Switch off the pan, in the empty hot pan, add the turmeric, salt, red chilli powders and sauté for 30 secs (this roasting is optional, but recommended for longer shelf life of pickle as any moisture in the powders are also taken rid of during this process). 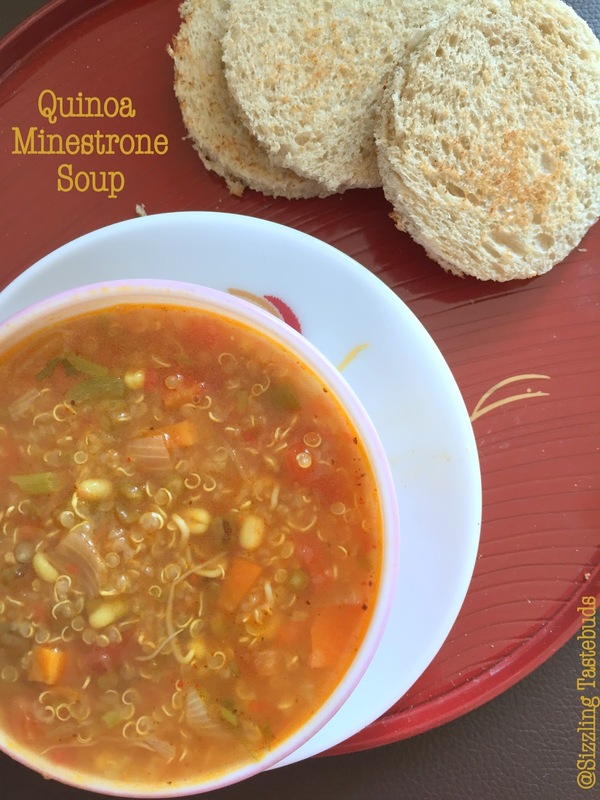 Sometimes a soup can be a wholesome dinner / supper option like today's Quinoa Minestrone Soup. We took a liking to Quinoa after we made Colombian Quinoa Salad, Bolivian Quinoa Stew, Moroccan Chickpeas Curry with Quinoa and Coriander Curd and the recent addition of the Indian-inspired Quinoa Adai (healthy quinoa n lentil crepes) that Mom made. Wiki says "Minestrone is a thick soup of Italian origin made with vegetables, often with the addition of pasta or rice. Common ingredients include beans, onions,celery, carrots, stock, and tomatoes.There is no set recipe for minestrone, since it is usually made out of whatever vegetables are in season. It can be vegetarian, contain meat, or contain a meat-based broth (such as chicken stock).Because of its unique origins and the absence of a fixed recipe, minestrone varies widely across Italy depending on traditional cooking times, ingredients, and season. Minestrone ranges from a thick and dense texture with very boiled-down vegetables, to a more brothy soup with large quantities of diced and lightly cooked vegetables;"
So, all in all, I wanted to experiment more with this and stumbled upon this wonderful Minestrone Soup wiith Kale and Quinoa. I made some minor variations and it was not only delicious, but vegan, gluten free and very filling. Dry roast quinoa for 30 seconds and soak. Boil with 3 times water till cooked. Drain and retain the water. In a large pan, heat olive oil. Saute onions and garlic. Add the veggies one by one and saute the for 2-4 mins. Pressure cook them along with moong sprouts with a pinch of salt for 2 whistles. Once cool, mash them up slightly. Once done, finish with lemon juice & serve hot with warm bread. Sending this to BM65 under Soups and salads theme, Also Linking this to Archana’s Soups and Salads Kids Delight event , created by Srivalli. Feta or any cheese is not my fav, so I made my little modifications to this universal favourite. 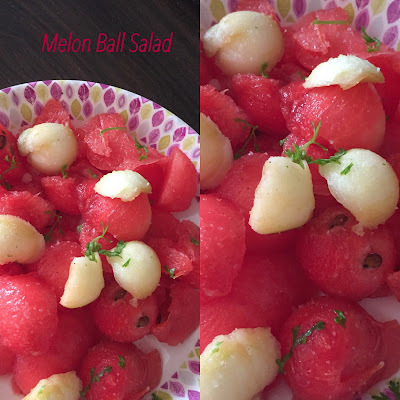 Summer or winter, this makes for a great refreshing salad with a zing that lasts. you may add feta or any sharp cheese if you like it, but be sure to serve it chilled for best results. With a melon baller, scoop out little balls from both the melons. Freeze these for an hour. Add a dash of salt and pepper and serve immediately. I can have soup as long as someone else makes it for me, and its well made (I am quite picky when it comes to my own food : I would rather have less food than not-so-good food), and the dear husband is miles away from any soup, unless its forced on to him as part of a weekend dinner along with home made bread ! so, what's cooking today is a new favourite that sprung up after I had a basketful of corn in the refrigerator and we had our fill of Corn Chaat and the like. The weather is kind of muggy with a splash of rain past few weeks and Soup for supper seemed like a good idea. Lets get to the recipe, now ! Pressure cook corn for 3 whistles or cook till soft. Leaving aside a handful of cooked corn, blitz the rest in a spice grinder or a food processor with very little or no water. In a pan, heat butter. Saute minced garlic and bell peppers till soft. 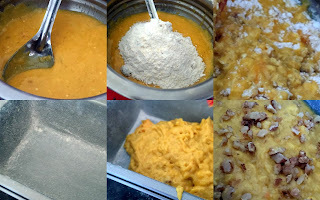 Now whisk in the pureed corn, boiled whole corn, veg stock, salt (if using canned stock, use salt sparingly) and bring to a simmer (approx 8-10 mins). Turn off the heat. Fold in the cream gently, and let it rest for 5 mins undisturbed. Serve hot with a dash of crushed black pepper and more salt if required. Any toasted bread goes well with this warm, filling soup. Sending this to BM 65 under Soups and salads theme,Also Linking this to Archana’s Soups and Salads Kids Delight event , created by Srivalli. 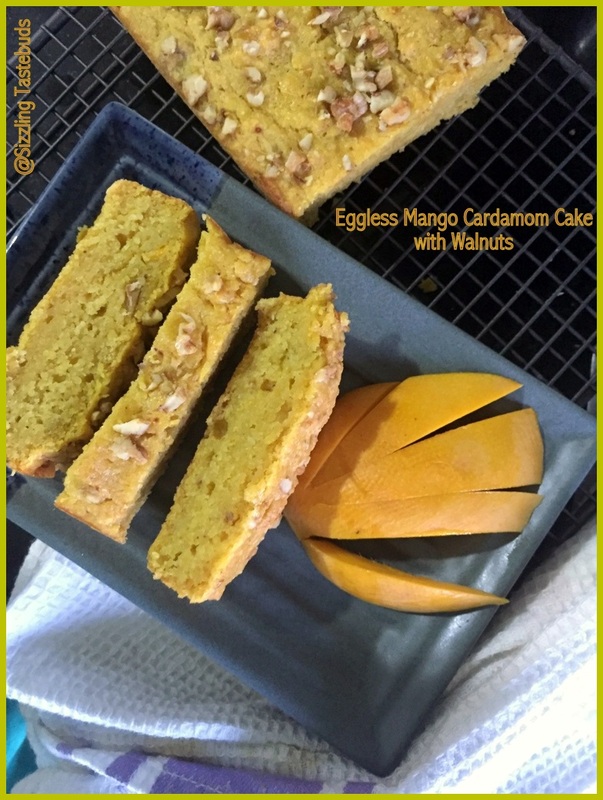 It was the peak of the mango till late last week, and while we enjoy all fruits as a whole, mango is quite versatile and lends itself to slushies / jams / bakes + cakes. This quick bread (or cake if you please) was made on a whim one afternoon, and vanished quite quickly. In hindsight, I should have added a little more of the puree, but will make it again next summer during the Mango bounty. Sieve all the dry ingredients twice over in a bowl. Ensure that the semolina is mixed in well. ** If making mango pulp at home, wash and peel 1 large sweet mango, cut into chunks and puree without any water. I used the season's best variety of Alphonso, you may use any variety as long as its sweet and doesn't have too much fibre. If using store bought / canned, dont add any extra sugar if it already contains sugar. Make sure to bring to room temperature before using. In another bowl, whisk the mango pulp and add sugar, mix well till dissolved, add the oil, yoghurt and mix evenly. Add the dry flour mix and 3/4 of the walnuts in batches and fold gently. Repeat till all the flour is mixed in without any dry streaks. Use 1 -2 tsp of water if need to make it moist if its too dry (I didn't need to use any extra water). Rest in the pan for 5 mins before unmoulding. Cool on a wire rack and serve warm or cold. You can serve as is or with a dusting of confectioner's sugar or a dollop of ice cream / whipped cream. 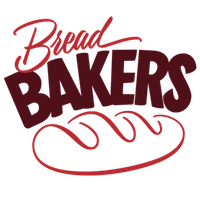 I love baking bread these days compared to everyday cooking :-)) The humidity here the past weeks is unbearable, but so conducive to baking breads - they rise like a breeze. 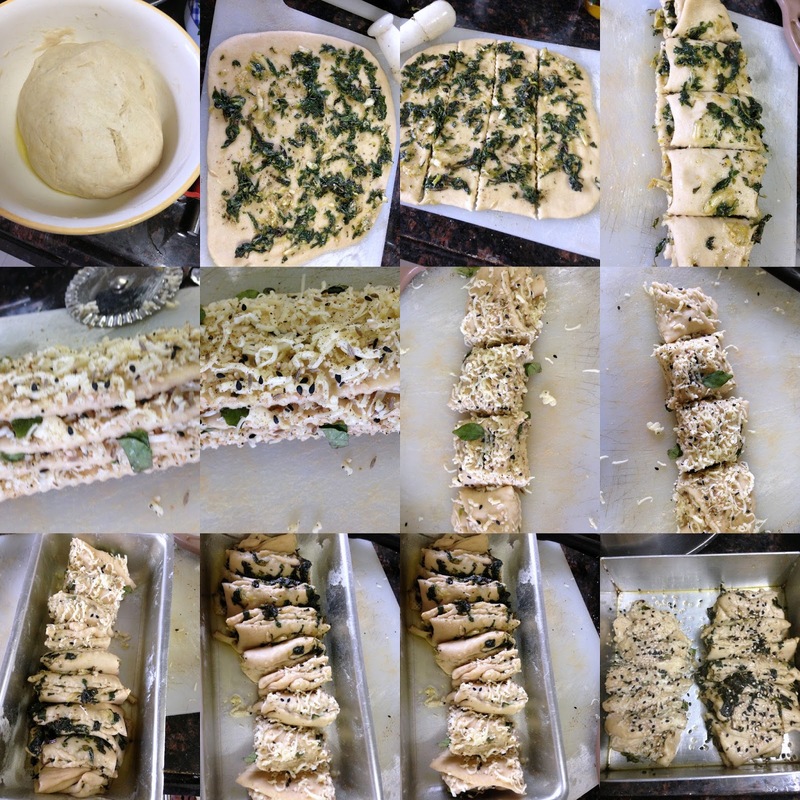 As my family likes savoury breads compared to sweet ones, I adapted the sesame and onion Pull apart bread and divided the dough into two parts with different stuffings : one with sauteed spinach and garlic and the other with chillies and indian spices (like cumin, chilli flakes). we loved them a lot, and they vanished quickly. The humidity is also due to the clouds that set in pretty early in the day making it impossible to take decent daylight pictures. However, these were two super delicious flavours that I loved to make and for us to eat. Goes well with any warm soup for supper / brunch. In a pan, heat 2 TBSP of olive oil and butter. Add chopped garlic, saute for 2 mins. Turn the heat to medium low and add spinach, saute for further 3-4 mins till the spinach wilts a bit. Turn off, add salt (caution - spinach is quite salty, so add with caution). Cool to room temp. Once the dough rises, punch down and knead gently for 2 mins. Divide the dough into two and keep them covered till you roll out. Take one portion and roll into a rough 8 * 10 rectangle on a floured surface into a slightly thin . Apply a layer of olive oil and brush it evenly. Then add the garlic- spinach mixture all over again. With a pizza cutter, make longish rectangular strips (about 2 inch broad). Stack the strips on top of each other and again cut them into squares. Gently place the squares along the length of the pan. Cover and let it rise for 30-45 minutes. Roll the other portion of the dough into a smaller rectangle. Spread olive oil, spread the chopped curry leaves, cumin seeds, sesame seeds, chilli flakes, sea salt, Grated Cheese. and cut into squares as above. Cover and let rise.